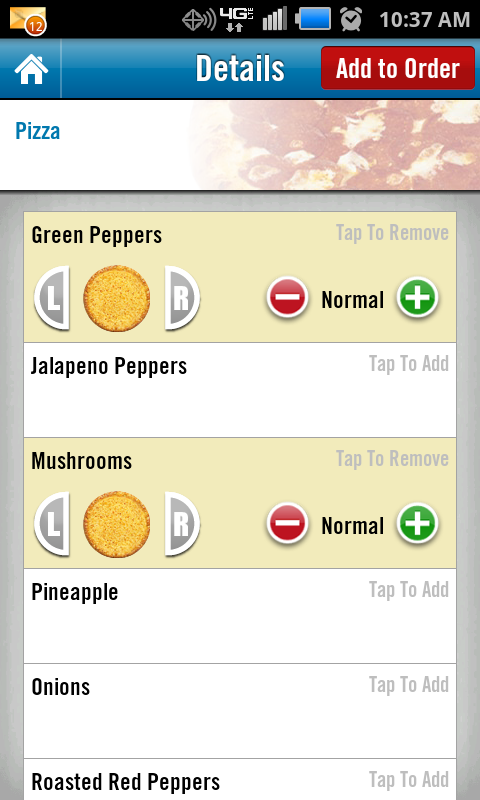 Getting a hot pizza delivered just got a little easier, thanks to Domino's Pizza and their Android application. Getting a cool Android phone free with a new contract did as well, again thanks to Domino's Pizza. Confused? Don't be, it's simple, really. Domino's knows you love pizza (we all love pizza) and they've made it super-simple to get one. 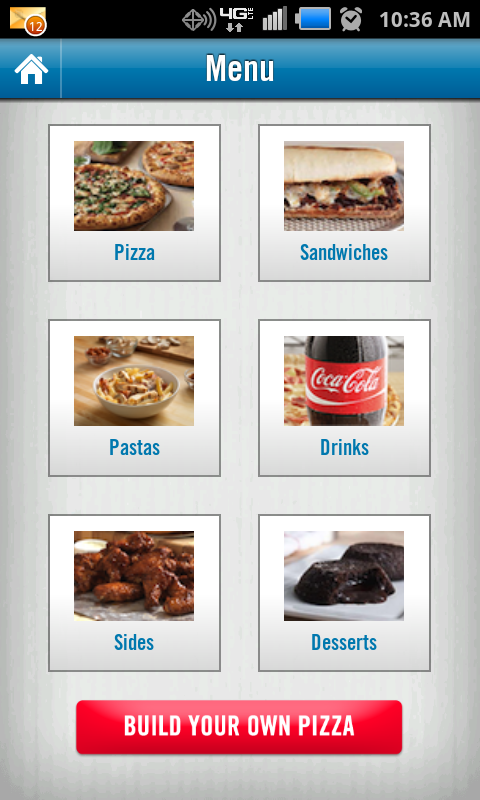 Grab the new Domino's app from the Market, click through to make your order, and wait for the delivery. 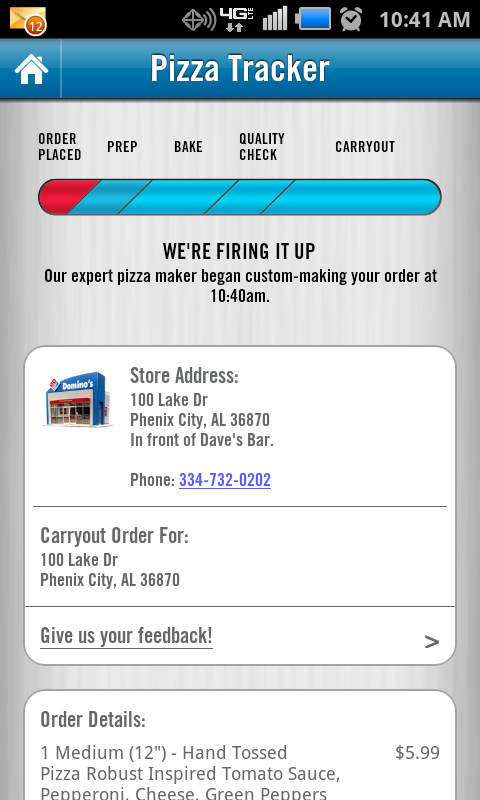 You can even watch the progress of your order right from the app, just like you can from the website when you order online. It's like the best invention of the 20th century (pizza) meets the best invention of the 21st century (Android), and it's a perfect match. So perfect in fact, that Domino's wants to help make it happen by offering free Android phones when you sign a new agreement with a US carrier. Offerings like the Motorola Droid 3 from Verizon, or the HTC Wildfire S from T-Mobile are yours for the taking from Domino's online, and fulfilled by Simplexity, and authorized agent for the carriers. So what are you waiting for? The app is free in the Market for phones running Android 2.1 or higher, and the phones are free from Domino's when you sign up for a new agreement. We've got more screenshots, the press release, and the download link after the break. 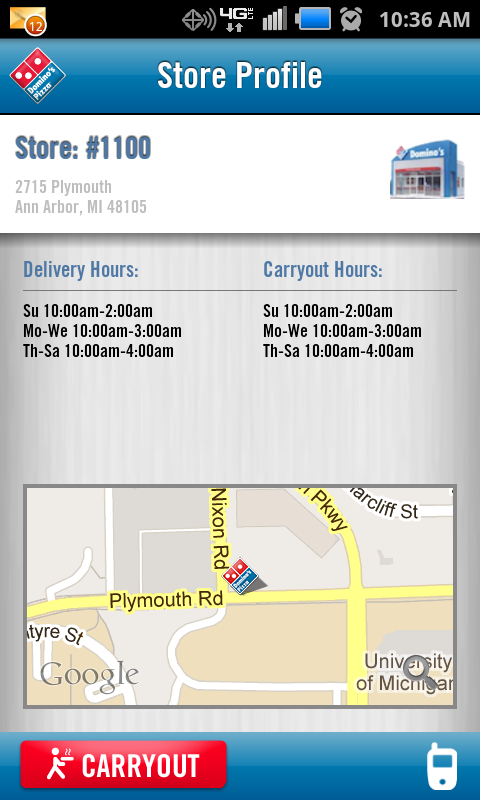 ANN ARBOR, Mich., Feb. 27, 2012 – Domino's Pizza (NYSE: DPZ), the recognized world leader in pizza delivery, is launching its brand new Android smartphone ordering app, available beginning today in the Android Marketplace. With the launch, and in addition to its existing iPhone app which debuted last June, Domino’s will now offer its mobile ordering app to more than 80 percent of smartphones. In addition to giving customers the ability to order from nearly every Domino’s store in the U.S. from the palm of their hand, Domino’s will also be offering free Android smartphones to customers who sign up for a new two-year service plan plus data (or extend their current plan which includes data, pending eligibility). Customers can select their phones at http://www.dominos.com/android. The app, which is compatible with Android version 2.1 and higher, extends many of the convenient features of Domino’s online ordering platform including: coupon search, full national menu, GPS store locator and the ability to follow your order with Domino’s Tracker. The Android application joins an already successful mobile and online ordering platform. Domino’s app for iPhone and iPod touch achieved $1 million in total sales in just 28 days, and just three months after its release, the app achieved more than $1 million in sales in a single week. 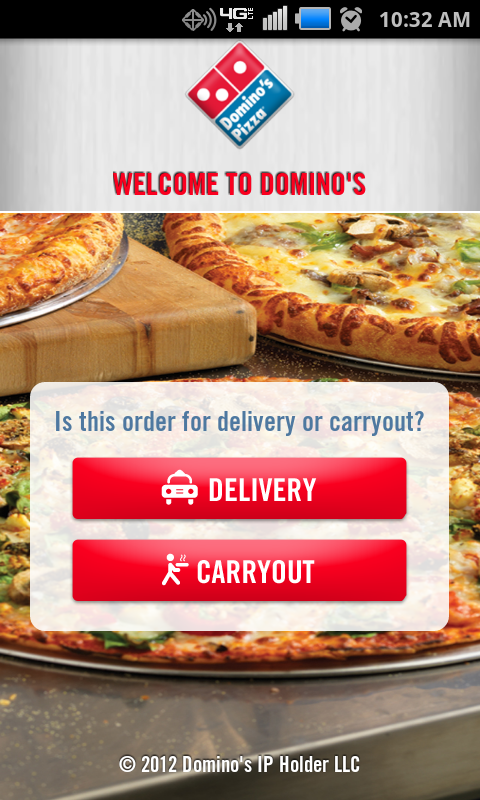 Mobile ordering, along with traditional online ordering, makes up 30 percent of Domino’s sales. Full details for the smartphone giveaway can be found at http://www.dominos.com/android. 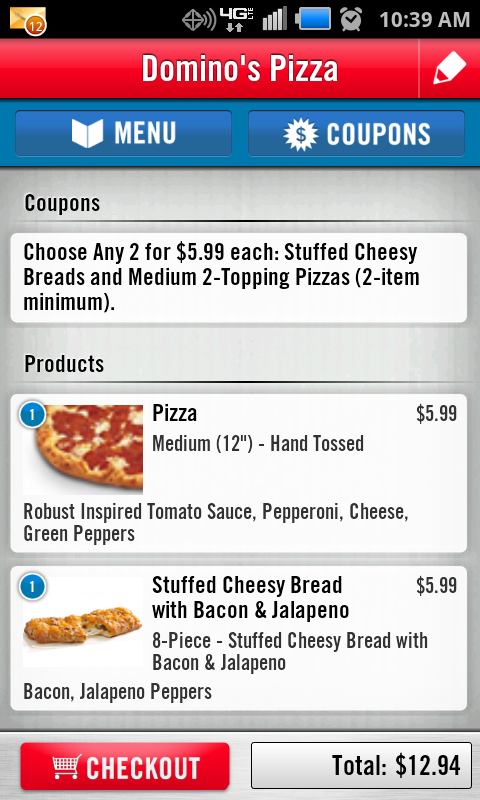 The Domino’s app is available for free from the Android Marketplace. Offers for Android smartphones and service plans are fulfilled by leading wireless solutions provider Simplexity, an authorized agent for the featured wireless carriers and manufacturers. Founded in 1960, Domino's Pizza is the recognized world leader in pizza delivery. Domino’s is listed on the NYSE under the symbol “DPZ.” As of the third quarter of 2011, through its primarily locally-owned and operated franchised system, Domino’s operated a network of 9,541 franchised and Company-owned stores in the United States and over 70 international markets. During the third quarter of 2011, Domino’s had global retail sales of nearly $1.6 billion, comprised of over $771 million domestically and nearly $813 million internationally. Domino's Pizza had global retail sales of over $6.2 billion in 2010, comprised of over $3.3 billion domestically and over $2.9 billion internationally. In May 2011, Pizza Today named Domino’s its “Chain of the Year” for the second straight year – making the company a three-time overall winner, and the first pizza delivery company to receive the honor in back-to-back years. In 2011, Domino’s was ranked #1 in Forbes Magazine’s “Top 20 Franchises for the Money” list. Helped by the launch of its Domino's Smart Slice school lunch pizza in late 2010, Domino's is collaborating with the Alliance for a Healthier Generation to serve healthier school foods and beverages in the United States. In late 2009, Domino’s debuted its “Inspired New Pizza” – a permanent change to its hand-tossed product, reinvented from the crust up.